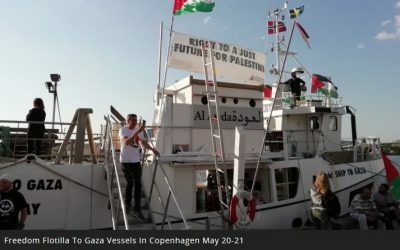 from Freedom Flotilla Coalition: Just before noon local time (May 23,2018), the Freedom Flotilla vessel Al Awda (The Return) was boarded by the German Coast Guard, at the orders of the German Ministry of Interior. They collected all the passports on board, wrote down everyone’s personal data, searched the vessel thoroughly, asked for detailed information about ports of call along the way to Gaza, and inquired about the whereabouts of the Swedish sailing boats traveling with us in parallel. The Scandinavian crew on this ship are all veterans of earlier Freedom Flotillas and attested that they have previously been harassed by other Coast Guards from European countries. Of course, our vessel is international waters and are doing nothing illegal – and this is by no means standard procedure. The massive German Coast Guard ship had been tailing Al Awda all morning, and finally sent a rubber dinghy with a crew of four to check it out.